WW1 Reenactments Equipment : Great War Tommy WW1 Documents, Paperwork : Church Army Huts Active Service stationery. WW1 Reproductions and WW1 Reenactors Equipment / Kit - Church Army Huts Active Service stationery. 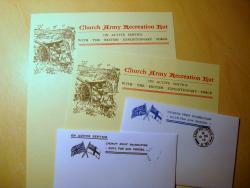 Church Army Huts Active Service stationery. 2 different replica envelopes and 2 replica headed writing sheets as sold to Tommy in the "Church Army Recreation Huts" - "For H. M. Forces. "On Active Service"